When I walk into the Rice Branch Library’s community room saddled with camera bags, Eleanor Bergholz looks concerned. The truth is, I have a very particular interest in visiting the group. Part of our focus in Buckeye is identifying and working with artists from the neighborhood on small-scale creative placemaking efforts. We're still in early stages of figuring out what exactly that will look like; after all, the stories that are surfacing in Sidewalks of Buckeye should inform our work moving forward. But in its earliest, roughest outline, the idea is simple. Locate neighborhood stakeholders already doing creative work in the Buckeye area. Connect them to resources and to one another. Work with that group to build a diverse programming scheduling that all aims to capture additional neighborhood stories. Throw open the doors and let these creative leaders lead the way. That's the idea anyway. But first step - find the artists and see if they're interested in doing a community-engaged project. 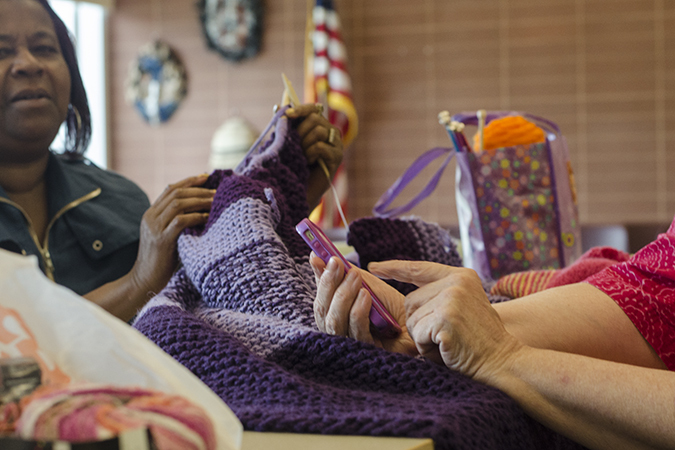 It doesn’t take long to confirm that the Harvey Rice knitting circle is a great first stop on that mission. Power is clearly what this group is building. Back when it launched in September 2012, it consisted of just three people. Slowly, they trained new knitters, and as word spread, it became a solid weekly social gathering. Attendance has ebbed and flowed, but tonight, 10 women from neighborhoods surrounding the library have gathered to craft together. As people unpack yarn and crochet hooks at the U-shaped table that will be their crafting workshop for the next two hours, Eleanor moves through a couple of agenda items – their upcoming outing to Wade Oval Wednesday, the possibility of participating in craft shows as a group … and then me. I launch into the explanation of Sidewalks of Buckeye that Justin and I have gotten so used to telling … That we’re working to tell authentic stories of people in the Buckeye area and to elevate the stories of people working to improve their community. Several people at the table nod. I’m preaching to the choir here. This is a group that’s all about building community through the arts. It’s a group who themselves have solidified friendships over knitting. By and large, they didn't know each other before they decided to join the group; they’ve found their way into this circle simply by walking through the library, seeing a black-and-white sandwich board sign and deciding to join. It’s clearly a winning strategy … As I’m walking in, a young woman stops to inquire about the classes and what she needs to bring. 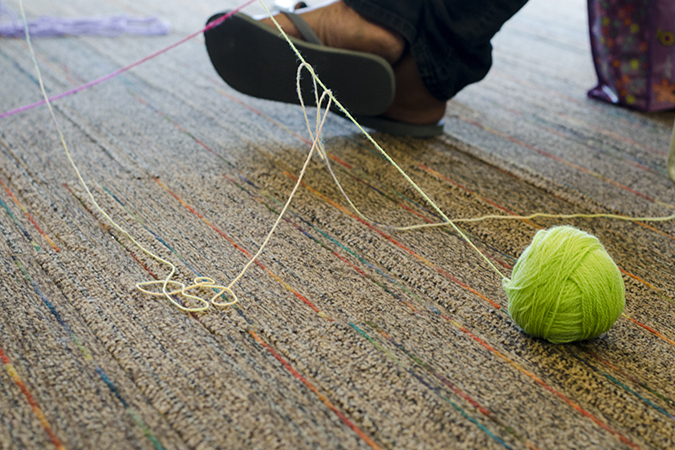 That's how it starts, and before you know it, you're a knitter. 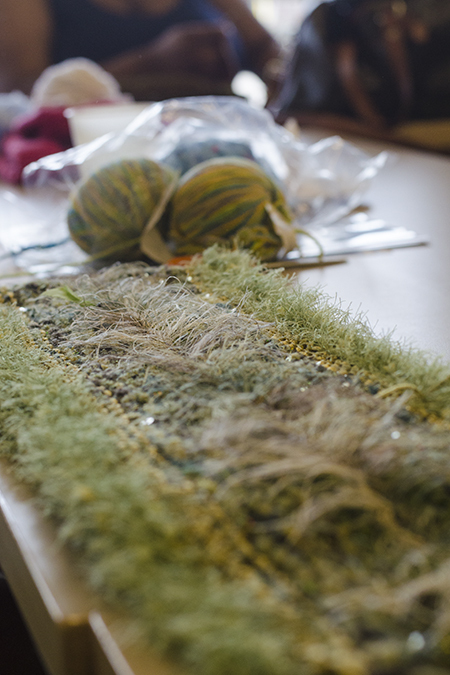 Through the weekly gatherings, Annie has made two caps, two scarves, and tonight, she’s working on an enormous, lavender blanket designed for a full-sized bed – a project that’s been a year in the making. Eleanor adds that people in the circle are “doing really, really high-quality work, but it’s clearly about more than just knitting" - it's about community. Participants have each other’s number and are frequently in touch between classes. Every couple of months, they get together for a potluck dinner. That’s how Kathleen, a resident of Shaker Square, found her way here. She’d been invited by Merras, her friend and neighbor. “I came for a potluck and loved it, so I kept coming,” she says. Kathleen’s been knitting for 50 years, but Merras had never knit before she joined the group two years ago, drawn in by that same sandwich board sign. She carefully unfolds and rearranges a gold and green and beaded scarf for me to see, and it's immediately clear that she's accomplished a lot in that short period. "I caught on very quickly. It was kind of like, wind her up and let her go," she laughs. 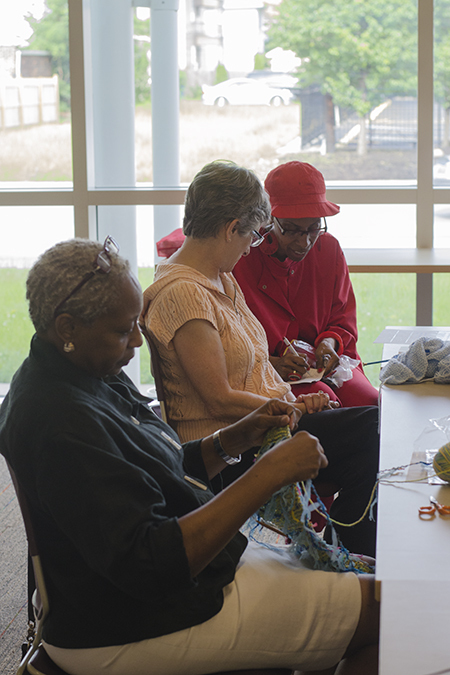 Together, Merras and Kathleen have helped to head up one of the group’s many community focuses: contributing custom knitwear to Cleveland Public Library’s annual Warm Up Cleveland campaign, which distributes warm clothing to people in need. Kathleen alone has knit more than 30 hats that she’s donated to the program, and months in advance, Merras already has six scarves ready for this winter’s donation drive. The group has also launched a children’s knitting group in the library, and Eleanor is quick to note that the majority of participants in that have been boys - very talented boys, from the sounds of it. It's just a few examples of a group that's thinking far beyond the library walls and how they can use their craft to positively impact lives. That energy is contagious, and sitting amid pink and purple balls of yarn and a table full of smiling women that I've only just met, it's hard to imagine not coming back - or not involving them in Sidewalks of Buckeye. Fortunately, several participants express excitement for Sidewalks of Buckeye. “There’s an overdue need to tell the story of this community,” says Lady Red, a former Buckeye resident herself. Yep, this definitely feels like part of the Sidewalk family. The knitting circle is free and open to the public. It meets at Cleveland Public Library's Rice Branch every Monday evening from 5 – 7, except holidays. 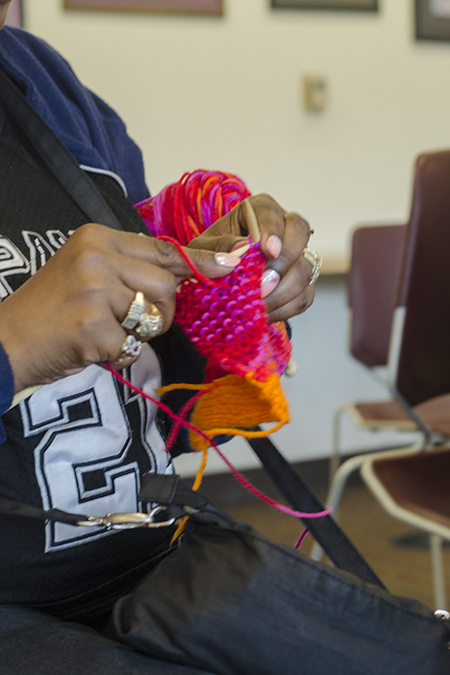 The children’s knitting group is held every Thursday at 4 p.m., except in the summer. DO YOU KNOW THE WAY TO SHAKER SQUARE?